Painted with juicy, plastic brushstrokes which create the texture of grass, foliage and bark through a sensuous impasto, this is a carefully composed landscape which paradoxically bears all the marks of having been produced spontaneously, en plein air. Although there is not an atom of sky visible, the whole painting is saturated with light and with the soft greens and golds of full summer. 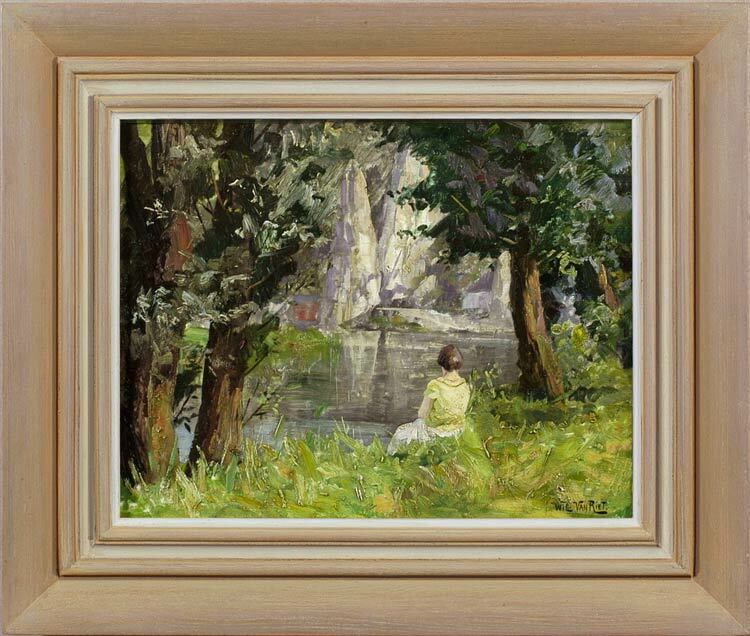 The seated figure, gazing out through the archway of trees, is partly an optical device which helps to draw the spectator’s eye through to the sunlit bank opposite and its clear reflection in the water, and partly an emotional trigger, giving a contemplative and melancholy cast to the scene. Because we only see her from behind, she loses individualism and expressiveness, becoming a type of Everyman invested with our own feelings. In this light, the landscape becomes highly symbolic, its sunny colours verging on the autumnal, and the river flowing ceaselessly on the journey of life. Willy Van Riet was born in Antwerp in 1887, and trained in his native city. He attended both the Academy of Antwerp and also at the National Institute of Fine Arts, where he was taught by Juliaan De Vriendt (1842-1935), an important religious, history and portrait painter of the period, Director of the Antwerp Academy and later President of the Royal Academy of Fine Arts of Belgium. Van Riet was awarded the Prijs Van Lerius and the Prix Nicaise De Keyser whilst he was a student; in 1913 he was also placed third in the Prix de Rome. He was a representational painter with Realist leanings, who produced mainly portraits, flowerpieces, still life works, landscapes and some allegorical scenes. He was also known for paintings of the female figure, which he considered the foundation of visual beauty. He seems to have been influenced by the latter elements of japonisme, since many of his still life paintings incorporate pieces of japonaiserie – painted screens, lacquer chests and boxes, statuettes, chrysanthemums and pieces of silk. He spent the First World War in Holland, moving back to his native Antwerp at the end of the war.